Set of two interconnected houses, 3 car garage with elevator located on a 24 hectare estate with its own cave and 300 m of waterfront. 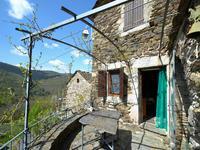 Nestled in the Gorges de la Jonte site, between Causses and Cévennes, in the heart of the . . . This small cottage has been renovated to reflect its history. There is a pretty balcony at . . .